You are here: Home › Biology › News › “Intraterrestrial” life found in rocks below the seafloor. The discovery that ancient rocks harbored microbial life deep below the seafloor confirms a long-standing hypothesis that interactions between mantle rocks and seawater can create potential for life. The scientists behind the discovery, from the Woods Hole Oceanographic Institution (WHOI), Virginia Tech, and the University of Bremen, have reported their findings in theProceedings of the National Academy of Sciences. The new study focused on mantle rocks that were originally exposed to seawater approximately 125 million years ago when a large rift split the massive supercontinent known as Pangaea. The rift, which eventually evolved into the Atlantic Ocean, pulled mantle rocks from Earth’s interior to the seafloor, where they underwent chemical reactions with seawater, transforming the seawater into a hydrothermal fluid. 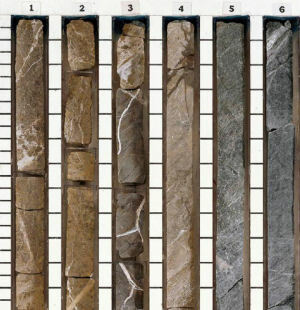 The rock samples analyzed in the study were originally drilled from the Iberian continental margin off the coast of Spain and Portugal in 1993. The researchers drilled through 690 meters of mud and sediment deposited onto to the ocean floor to reach the ancient seafloor created during the break-up of the supercontinent Pangaea and the opening of the Atlantic Ocean. The drill samples had been stored in core repositories at room temperature for more than two decades, before Klein and his colleagues began their investigation and discovered the fossilized microbial remains. In the lab, samples from the rock interior had to be extracted since the outside of the drill core was stored under non-sterile conditions. 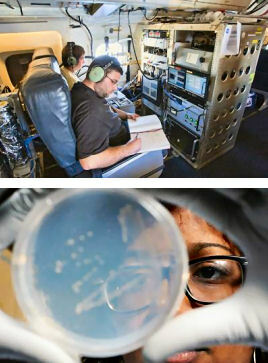 So Klein and his colleagues took a number of careful steps to ensure the integrity of the sample interior wasn’t compromised, and then analyzed the rocks with high-resolution microscopes. While Raman spectroscopy enabled Klein to verify the presence of amino acids, proteins and lipids in the samples, it did not provide enough detailed information to correlate them with other hydrothermal systems. The lipids were of particular interest to Klein since they tend to be better preserved over long timescales, and have been studied in a wide range of seafloor environments. This prompted Klein to ask Florence Schubotz, an expert in lipid biomarker analysis at the University of Bremen, if she could tease out further information about the lipids from these ancient rocks. The study reinforces the idea that life springs up anywhere there is water, even in seemingly hostile geological environments – a tantalizing prospect as scientists find more and more water elsewhere in the solar system. But Klein contends that, while scientists have long understood many of the forces driving microbial life above the seafloor, there is still a great deal of uncertainty when it comes to understanding biogeochemical processes occurring in the oceanic basement. Soviet book about life in space. The emergence of life in the universe. 1963.